Do it yourself chocolates decorated with lovely theme papers. 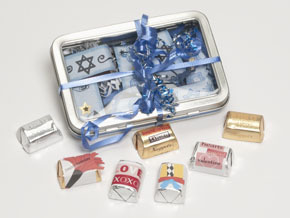 Papers can be changed to celebrate any occasion for your favorite chocolate lover. Give these yummy chocolates in personalized wrappers as a teacher gift, holiday surprise or keep them and nibble them all by yourself.